The Carlisle Area Chamber of Commerce is a central resource for the business community. We are a catalyst for change and growth in the local economy to create a prosperous business climate in Carlisle, Iowa. As the go-to resource for promoting and assisting new and existing businesses by encouraging economic development, advocacy, education, and resources for Carlisle businesses, we positively impact the Carlisle community overall. Through the ongoing involvement in developing and nurturing relationships with government, educational organizations, and other community sectors to facilitate the needs and interests of the business community, we encourage change and growth in the local economy to create a prosperous business climate. The Carlisle Area Chamber of Commerce is a cornerstone in the community supported by both the community and chamber members. As a result, our members participate in our programs because they are relevant and pertinent to our members who live and work in this community. Our members also feel the Chamber and its programs are integral to their financial and organizational success. In addition, our Carlisle Area Chamber of Commerce members hold dual membership with the Greater Des Moines Partnership to expand our businesses reach into our neighboring communities. Benefits of Chamber membership include business networking and personal development, including business and leadership skills; quarterly meetings and special events; educational workshops; legislative forums and meetings; community and area events; and pertinent information that may affect your business in weekly email blasts and bi-monthly newsletters. Our efforts for community betterment are accomplished by active Chamber member participation through well-led committees and task forces to coordinate and support local events and programs. 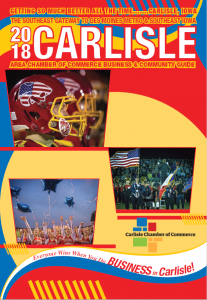 Check out the New Carlisle Area Chamber of Commerce 2018 Business & Community Guide available HERE! 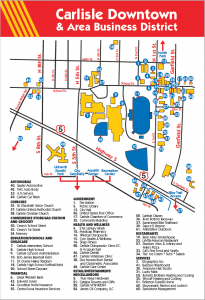 The New 2018 Carlisle Downtown & Area Business District Map available HERE! The Carlisle Area Chamber of Commerce is pleased to announce the new and improved Directory/Guide for 2019 will be published in late June. Hurry to get your ad placed, as space is limited! Keep in mind the deadline is May 6th, 2019! CLICK HERE for the informational and ad space sign-up flyer!